Houghton Mifflin Harcourt, 9780547195612, 432pp. 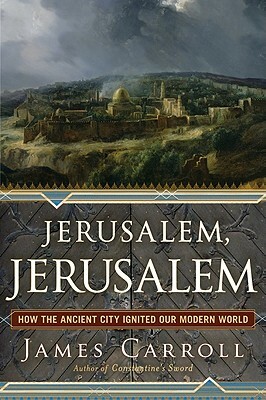 James Carroll’s urgent, masterly Jerusalem, Jerusalem uncovers the ways in which the ancient city became a transcendent fantasy that ignites religious fervor unlike anywhere else on earth. That fervor animates American history as much as it does the Middle East, in the present as deeply as in the past. In Carroll’s provocative reading of the deep past, the Bible came into being as an act of resistance to the violence that threatened Jerusalem from the start. Centuries later, holy wars burned apocalyptic Jerusalem into the Western mind, sparking expressly religious conflict among Jews, Christians, and Muslims. The heat stretched from Richard the Lionheart to Field Marshal Edmund Allenby, whose World War I conquest of the city relit the fuse for a war that still rages. Carroll’s brilliant leap is to show how, as Christopher Columbus was dispatched from the Crusades-obsessed Knights Templar’s last outpost in Iberia, the New World too was powerfully shaped by the millennial obsessions of the City on a Hill — from Governor Winthrop to Abraham Lincoln to Woodrow Wilson to Ronald Reagan. Heavenly Jerusalem defines the American imagination — and always, the earthly city smolders. Jerusalem fever, inextricably tied to Christian fervor, is the deadly — unnamed — third party to the Israeli-Palestinian wars. Understanding Jerusalem fever is the key that unlocks world history, and the diagnosis that gives us our best chance to reimagine peace.